Zimbabwe 5-118 (Elton Chigumbura 53*, Timycen Maruma 22*, Manjula Guruge 2-18) beat United Arab Emirates 116 (Swapnil Patil 30, Khurram Khan 26, Sean Williams 3-15, Sikandar Raza 2-15) by five wickets. U.A.E was bowled out for 116 runs in 20 overs and Zimbabwe blasted 118 for the loss of five wickets with 38 balls to spare. 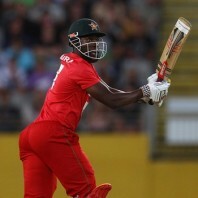 Elton Chigumbura (Zimbabwe) was announced ‘Player of the match’ for his impressive knock of 53 from 21 mere balls. The ICC World T20 – 11th match, First Round, Group B, was held on Friday, March 21, 2014, at Sylhet Stadium. Earlier, Brendan Taylor won the toss for Zimbabwe, elected to field and got two quick wickets at eight runs. The skipper of U.A.E, Khurram Khan and Swapnil Patil provided some resistance to the rival bowling with brisk scoring. The fifty of the partnership was attained in the 9th over while Khurram Khan was gone at 66 for 26 and Patil followed him one run later for 30. The middle and lower order batting collapsed and Kamran Shahzad was the only other notable batsman with 21. The entire U.A.E team was sent back to the pavilion for 116 on the last ball of the 20th over. Sean Williams was the star performer with three wickets whereas Tendai Chatara and Sikandar Raza shared two each. Zimbabwe lost their three top order batsmen for just 24 runs and the fourth one departed 10 runs later. They were in dire trouble once they surrendered the fifth one at 63 when Elton Chigumbura along with Timycen Maruma got together in the middle. The duo opted to attack and started punishing the bowlers at will while the first was dropped at 34 and they went past the hundred runs mark in the 12th over. Elton Chigumbura powered his maiden T20 fifty with a grand six and won the game for his country. 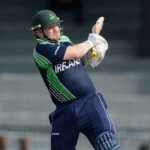 He secured his end for 53 off just 21 deliveries with 3 giant sixes and 6 fours while Maruma was at the other end at 22 as Zimbabwe amassed 118 for the loss of five wickets in 13.4 overs. Manjula was the main wicket taker with two whereas Shadeep Silva, Ahmed Raza and Khurram Khan got one wicket each. Zimbabwe triumphed in their last pool encounter with a hefty margin of five wickets and raised their tally to four points.